It’s been a big week for your humble blogger, vis-a-vis finding incriminating evidence on government websites. Here’s another example of something I have warned of (repeatedly) since the inception of this blog, now coming to fruition. That like so many other countries in the Western world since 2008, our government too would, someday, use the pretext of “crisis management” to steal your super to prop up an insolvent financial system. Today, we learn that the Orwellian euphemism that has been chosen to describe this process in Australia, is “direction powers”. 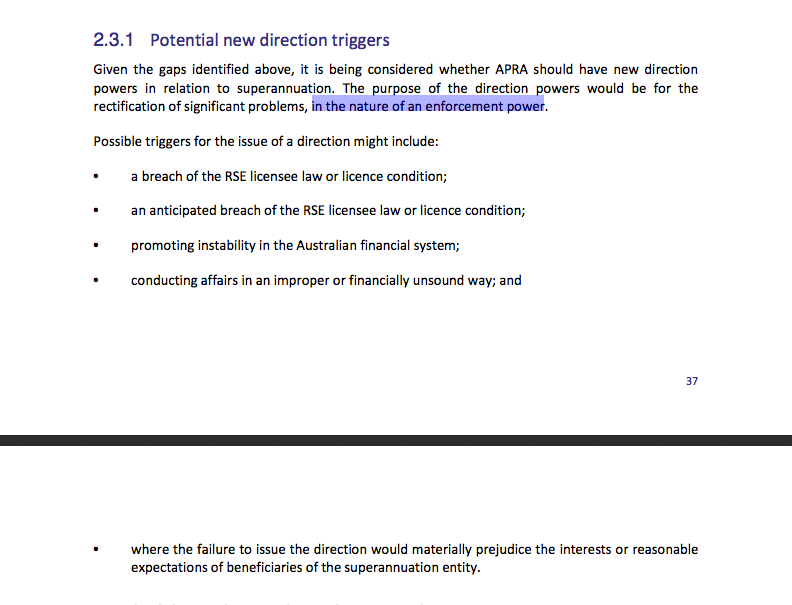 …it is being considered whether APRA should have new direction powers in relation to superannuation. The purpose of the direction powers would be for the rectification of significant problems, in the nature of an enforcement power. where the failure to issue the direction would materially prejudice the interests or reasonable expectations of beneficiaries of the superannuation entity. Note carefully what is being described here. APRA has comprehensive direction powers in relation to ADIs, general insurers and life insurers but not in relation to RSE licensees, even though the superannuation sector holds approximately $1.4 trillion in savings and a number of superannuation entities hold tens of billions of dollars in assets. Oh dear! All that money, just sitting there making private sector fund managers rich on fees, and they (the government) don’t have the power to direct what happens to it. Sacre bleu! Now here is where the cunning comes in. How do you ensure that you give yourself the ability to “trigger” your new “enforcement power”, in order to give “direction” to a superannuation fund to … oh let’s say … direct a percentage of its (ie, yours, dear reader) money into government bonds to support the national government’s solvency? Or to the shares of a collapsing bank? Or to the shares in a new “bridging institution”, as directed by the FSB under its new, G20-wide bank resolution “bail-in” regime? In other words, if APRA (or the IMF, or FSB, who now tell APRA what to do) were to decide that it “would materially prejudice” your interests if they did NOT “direct” your super fund to do whatever the government wants, then that is all the “trigger” they need to enforce a “direction” on your super savings. Think I’m twisting what they said? What if the “identified concern” is that “failure to issue the direction would materially prejudice the interests or reasonable expectations of beneficiaries of the superannuation entity”? Or what if the “identified concern” is simply that the super funds are not parking your money in the “investments” that the government wants them to, and that this is or could be “promoting instability in the Australian financial system” — another one of the “triggers” listed? By this action, the government is effectively abrogating to itself what is essentially an unlimited power to “direct” your super fund to do “specifically” whatever the government says with your money, under the dangerously broad, and subjective, Big-Brother-Knows-Best pretext that “failure to issue the direction would materially prejudice” your interests.